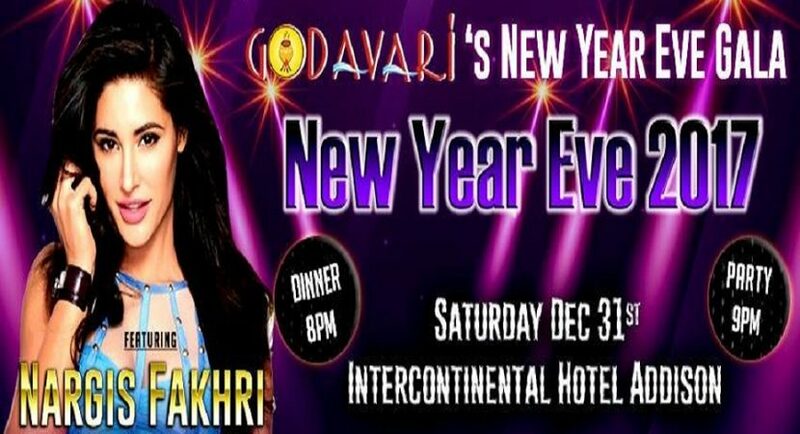 Godavari’s New Year Eve Gala presented to you by FunAsiA, KFC, Dallas Renal Group, Riceit and Mezban Foods. Intercontinental Addison with Nargis Fakhri as the Celebrity guest on Dec 31st. Dinner begins at 8 PM and party begins at 9 PM. 1. Where can I buy tickets for the event? 2. What is the venue location for the 2 parties? 3. Can I buy tickets for both parties? 4. Are there any babysitting options available at the party? Yes, onsite baby-sitting is available at the hotel for the duration of the party and can be purchased along with the tickets; it is $25 per child. 5. Is there dinner available at the party? Yes, dinner can be purchased along with the tickets (check ticket section for options). It is a dinner buffet provided by Godavari restaurant. 6. What are the timings for dinner? Dinner 7:30 -10:30 pm. Dinner buffet with vegetarian and non -vegetarian options, along with appetizers. Dinner tickets have to be purchased along with the party tickets for adults as well as children. 9. What are the timings for the party? Doors open at 7pm and the party is until 2am January 1st 2017. 10. Can tickets be purchased at the door? 11. What about reserved seating? Reserved seating must be purchased (see ticket options below)?What are the ticket options available for both parties? Vvip table of 10 – $900 reserved seating for 10 adults in one party room + dinner for 10 adults + celebrity picture with entire group + bottle of champagne for table.